Last updated 11 February 2019 . By Georgia Evans. It may seem like an unusual concept, but Angelina's multicultural mashup is bringing together authentic Japanese and Italian flavours with innovative technique. Dishes from the eight plate sharing menu include unagi risotto with burnt soy butter and dashi, sirloin, radichio, and hibachi, and datterini tomato, smoked sausage, oba leaf and mint. If you're just looking for a quick bite to eat, there is also the option to have a single daily plate. To enhance the dining experience, a carefully curated wine pairing is featured on the menu alongside a selection of cross-continental cocktails, such as the Gianduja Coupe, which takes Italian coffee and chocolate, and mixes it with Japanese whisky. These can be enjoyed in the Golden Gai bar, inspired by Tokyo's Shinjuku district. Seating just six people, this hideaway is one of East London's smallest haunts. The restaurant also has an intimate feel, with just 40 covers decorated in a modern, minimalist aesthetic. 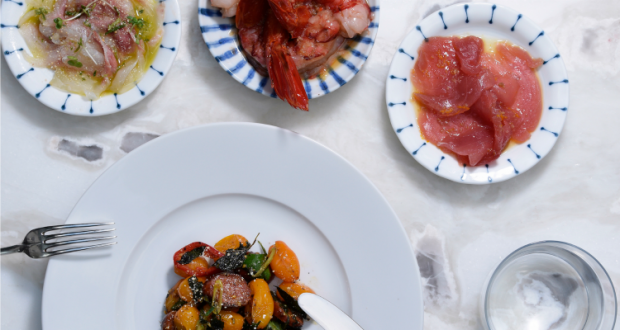 Inspired by avant-garde Japanese fashion and Italian craftsmanship, caricatures line the Golden Gai and pay homage to Angelina's East-Asian influence, while a large Italian marble bar overlooks the dining area's open kitchen. Angelina will be open to the public from the 20th February, with a softy launch between 14th - 17th February offering diiners 50% off their food bill.